**** UPDATED 2/2015! Thanks @Inquisitive;! General:The downpipe on your Mazdaspeed vehicle (whether it's a gen1 MS3, gen 2 MS3 or MS6) is the first part of your exhaust coming off of the turbo. 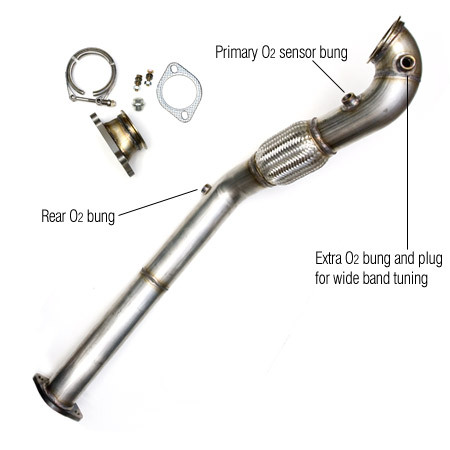 The stock or OEM downpipe on your vehicle contains one catalytic converter. Replacing your downpipe is a common upgrade that results in some very impressive power gains over your restrictive OEM unit, while giving your car a louder, more aggressive exhaust note. Warning: It has been seen that after upgrading to a 3" downpipe that some vehicles will end up with smoking turbos. This is because of the reduced back-pressure on the turbo seals, which allows some oil to pass by. There are several easy fixes to resolve this issue, the first and simplest fix is to raise the idle on your vehicle through your tuning software. Another simple fix is to swap out the stock oil feed bolt with a smaller diameter feed hole, @bnoon makes and sells these bolts. Things you NEED to know: Downpipes for Mazdaspeed vehicles are manufactured in two different styles. The first style is generally referred to as just a "3inch downpipe", these units will replace your original downpipe and ONLY the original piece (these are generally coupled to a "race pipe" or "test pipe" *SEE DIAGRAM ABOVE*which removes your secondary catalytic converter). The other style is known as a "Long downpipe" or "Full downpipe", meaning the new part will replace BOTH your stock downpipe and also your stock "race/test pipe". Downpipes are generally sold with two options. They are referred to as either being cat-less or as having a high flow cat (the term cat refers to a catalytic converter). A cat-less downpipe is exactly what it sounds like, it replaces your OEM piece with a new 3" downpipe possessing NO catalytic converters. One possessing a High Flow Cat, also, is exactly what it sounds like, it replaces your stock restrictive cat for a more efficient, higher flowing unit. Generally, cat-less downpipes provide a few more peak ponies and a more aggressive exhaust notes than pieces with a high flow cat, BUT at the risk of the car receiving a CEL (Check Engine Light). Note: If a downpipe contains a high flow cat it is generally a "Long/Full downpipe". However, there are ways to help prevent this CEL by extending your rear/second o2 sensor away from the main flow of exhaust through the downpipe. Some manufacturers include these fixes with their products, while others do not. You should take care of the HPFP limitations before considering the removal of a cat or going completely cat-less. The DP is the most restrictive section of your exhaust system. The bell housing is so crimped; it is hard to imagine the waste-gate having enough room to open. It contains cat-1, which is heavy, but not as heavy as cat-2. If required for emissions control, if you do not have the software to cancel the CEL (in AP un-tick codes: P0038 and P0420 (if rear spark plug de-fouler does not work)) or if you are allowed to disable two codes only for emissions testing, you will need a fast cat with following oxygen sensor bung for the second sensor. A DP provides faster turbo response times and power gains across the rev range. The transition from decelerating to accelerating is much smoother. The engine just seems to breathe easier, probably due to the increased VE. Divorce pipes reduce the turbulence caused by the opening and closing of the waste-gate. Also, the nature of bell housing designs creates turbulence as the chamber is expanded to cater for the turbo outlet and waste-gate. Having dedicated pipes respectively allows for same size pipes and thus, a smoother flow. By joining further down, they help to speed up the extraction resulting in faster opening of the waste-gate. A Long or Full DP includes the DP and TP / RP. The TP / RP always removes cat-2 and can be purchased with or without resonator delete for use with the OEM / stock DP or aftermarket DP. 3” 304 SS cat-less (weight saving) CNC machined flanges, reuses the stock donut flange system to allow for necessary movement. The removal of the 2nd cat will NOT trigger any check engine lights. The test pipe will bolt right up to both the stock and aftermarket cat-back exhaust systems. I'm still looking for a good how-to thread for MS6 dp install. If any of you have one just post up the link and I'll add it to the OP. 4. Lift front end as high as possible. Use e-brake & chocks behind rear wheels. Place jack stands in secure location under frame rail. 5. Remove upper and lower O2 Sensors...Carefully. 6. Unbolt DP from CBE. Disconnect 2nd Cat to ease removing DP. 7. Unbolt DP from turbo. 8. Curse Mazda for their stupid 5 bolt flange. 13. Finangle new DP into place. Try not to damage anything in your engine bay in frustration. 14. Bolt DP to turbo. 15. Swig beer. Curse Mazda's 5 bolt again. 17. Install heat shields, TMIC (if you haven't upgraded to a real IC yet), battery. 18. Ice cold beer. Say either "ehh, wasn't too bad" or "Fcuk you Mazda!" As accurate as that is, I'll try to find a real write up for you bro. Great thread homie. 145 + free shipping. Wow Ebay has gone alot cheaper. lol omg dont remove the stock manifold on the MS6. I thought the O2 and spare O2 bungs are the opposite- that is the primary is closer to the turbo? Thanks trying to decide on one now. -GTX3071R , 38mm Tial Wastegate, CPE Exhaust Manifold, Cobb AP, HKS SSQV 4, Autotech Internals, JBR SSP & Bushings, JBR Fully mounted 88 duro, JBR OCC, JBR EGR delete, TWM M1Knob, H&R springs, Ultimate Racing Turbo back, NKG plugs, CP-E FMIC, big MAF, big TIP, Grimmspeed MBC, SPC Rear Camber Arms, JBR Sway bar. Sent from my left nut. What a GREAT summary, thanks OP!!!! Thanks Tom, Well done Sir! Now I'll have to find a nurse for you! Nator is what it does. +1 to the above posts on the M2 & ebay dp's. and OP yea two of my friends have one and im getting one in a few weeks. imo no reason to get a more expensive one other than namebrand. I'm not posting eBay DP's for the simple fact none of our vendors offer them. And I'd rather see our members buy from them personally. On the M2, is that the before/after o2 bungs right next to each other at the top? lol, or is there a lower bung that isn't seen? there are three bungs total on the m2, two at the top and one at the bottom. all the bungs come with plugs. Will that one fit the 2010's? I was going to go with the M2, but this one is a little cheaper, and the end of the M2 one has a part that sticks out passed the flange? Also, FWIW, that's the same vendor I purchased my M2 dp from on ebay. Do you know why some of them have the extension after the flange at the end? Wow...awesome, thanks for clearing that up haha. Lol i believe in them, but i dont believe ud get much more than 5 whp and 10wtq.,which in my opinion is not worth the hassle. Ohh is that what it is? I agree...if we actually have ANY dynos of before/after DP only. But how many ppl have spent the money to do that?